In addition to a post about Clay Roueche’s Combined Combat System of martial arts, someone has also made a post about a non profit group he has created called Phoenix Reborn. The primary purpose of this non profit is to assist misguided youth, recovering addicts, military veterans, victims of abuse, and positive re-entry for prisoners returning to society. This is a lot more effective at helping people in the life than a poster that says free hugs. 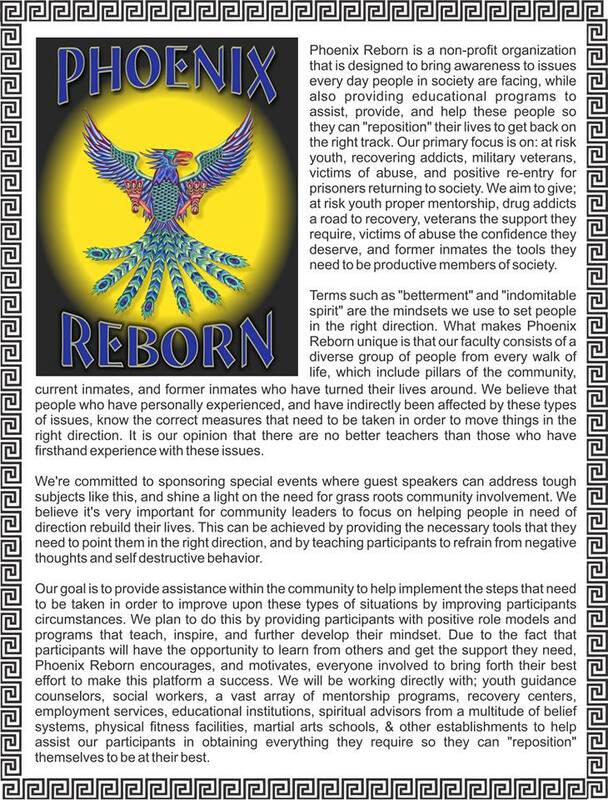 Phoenix Reborn is a non-profit organization that is designed to bring awareness to issues every day people in society are facing, while also providing educational programs to assist, provide, and help these people so they can "reposition" their lives to get back on the right track. Our primary focus is on: misguided youth, recovering addicts, military veterans, victims of abuse, and positive re-entry for prisoners returning to society. We aim to give; misguided youth proper mentorship, drug addicts a road to recovery, veterans the support they require, victims of abuse the confidence they deserve, and former inmates the tools they need to be productive members of society. Terms such as "betterment" and "indomitable spirit" are the mindsets we use to set people in the right direction. What makes Phoenix Reborn unique is that our faculty consists of a diverse group of people from every walk of life, which include pillars of the community, current inmates, and former inmates who have turned their lives around. We believe that people who have personally experienced, and have indirectly been affected by these types of issues, know the correct measures that need to be taken in order to move things in the right direction. It is our opinion that there are no better teachers than those who have firsthand experience with these issues. We're committed to sponsoring special events where guest speakers can address tough subjects like this, and shine a light on the need for grass roots community involvement. We believe it's very important for community leaders to focus on helping people in need of direction rebuild their lives. This can be achieved by providing the necessary tools that they need to point them in the right direction, and by teaching participants to refrain from negative thoughts and self destructive behavior. Our goal is to provide assistance within the community to help implement the steps that need to be taken in order to improve upon these types of situations by improving participants circumstances. We plan to do this by providing participants with positive role models and programs that teach, inspire, and further develop their mindset. Due to the fact that participants will have the opportunity to learn from others and get the support they need, Phoenix Reborn encourages, and motivates, everyone involved to bring forth their best effort to make this platform a success. We will be working directly with; youth guidance counselors, social workers, a vast array of mentorship programs, recovery centers, employment services, educational institutions, spiritual advisors from a multitude of belief systems, physical fitness facilities, martial arts schools, & other establishments to help assist our participants in obtaining everything they require so they can "reposition" themselves to be at their best.